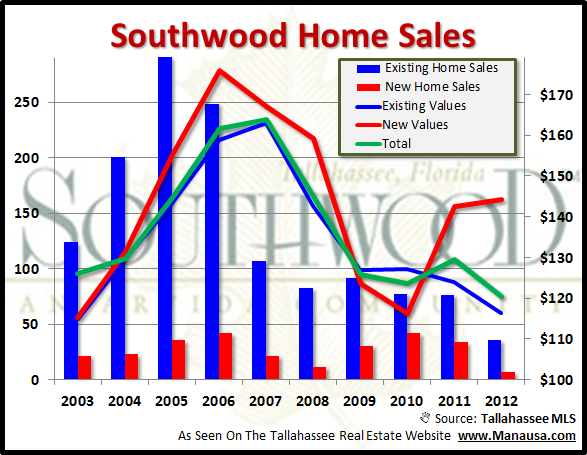 There is an interesting trend occurring with Southwood homes these days, and long-time readers of the Tallahassee Real Estate Blog might remember our Southwood forecast last year anticipating this very thing. When we look at the real estate graph to the upper right, we see (blue bars) that year-to-date sales of Southwood homes is at an all-time low. The continued new construction from the past few years has finally reached a point where land values and new construction prices are at odds. For years, the developer has been liquidating lots at low prices, allowing builders of Southwood homes to continue to bring new construction to compete with the homes for sale in Southwood at prices below existing home sale values. We have seen the number of Southwood homes on the rise, even as the overall housing market saw demand continue to slide. People were excited to buy new homes cheaper than existing ones, so Southwood was able to keep the streak running. But something has changed. Over the past three years, roughly one third of all sales of Southwood homes have been new construction. You can see (red line) in the graph above, it was because these homes could be delivered to the market at values below existing home sales (blue line), but that is no longer the case. If the developer wants to see new construction continue to flourish, lot prices will need to come down even more (thus reducing the value of the land beneath all existing homes in Southwood). Currently, the average size of new Southwood homes is 2,073 sqft, and they are selling for nearly $28 per square foot higher than the resale market. This is why we see the sale of new Southwood homes moving so much slower now than in previous years. If we multiply the size and value differential, the developer must consider reducing land values by $57K per lot in order to continue the stimulus of sales of new Southwood homes, and I suspect this would bring land values very close to zero! In other words, existing owners of Southwood homes can finally expect to see diminished competition from new home sales. 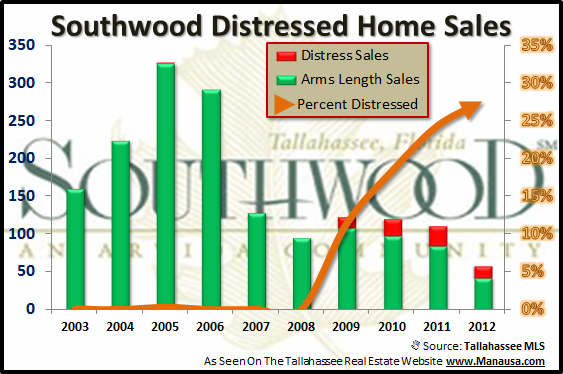 As with the rest of the Tallahassee real estate market, Southwood is seeing a rise in distressed home sales. I am going to keep an eye on Southwood, as I believe they are going to have to deal with a higher volume than many other areas that were not building over the past three years. These new home buyers that find themselves needing to sell in the next five years are not going to be happy with their negative equity situation. If you need to sell a home in Southwood, it is imperative that you do a thorough analysis of your competition so that you don't lose time or focus in your marketing plan. Home values are still declining, thus hitting the market as the right price will allow you to sell for top dollar, whereas missing the right price will cause you to waste time (and then have to reduce to newer, lower values). If you would like to know more about selling your Southwood home, just drop me a note and we can schedule a time to discuss your specific situation and needs. I hope this report on Southwood homes has provided you the information that you sought, if not, just comment below and let us know what else we can provide.